The first batch will be available as a frame only for $2,999 USD, allowing customers to handpick their ideal components, although there will be complete bikes a little further down the road. Our test bike was built up with Shimano's new XTR brakes and 12-speed drivetrain, a 150mm Fox 36 Performance Elite fork, DPX2 shock, and, in a nod to Forbidden's Canadian roots, We Are One carbon rims laced to Industry Nine's Hydra hubs. Construction and Features Forbidden's main headquarters are in Cumberland, British Columbia, but the Druid's carbon frame is made overseas in the VIP factory, the same facility that produces high-end frames for several well-known brands. It's the Druid's suspension layout that gets the most press, but there are a ton of little frame details that are also worth mentioning.“How many chains does that thing need?” I lost count of how many times that question came up, but I wondered the same thing the first time I laid eyes on the Druid. The answer is one for the small and medium frames, and one plus a few extra links on the L and XL sizes. A custom seatstay protector keeps the frame safe, and the amount of chain slap noise to a minimum.In addition to being able to fit a water bottle on top of the down tube, there are also two bolts on the underside of the top tube that can be used to hold something like Wolf Tooth’s B-Rad system, which is cleaner way of storing a tube or tools compared to a strap or a bunch of unsightly electrical tape. There’s even a little secret compartment underneath the downtube protector. It’s not that easily accessible, so it's best to think of it more like a fire extinguisher housed behind glass – for emergency use only. The amount of space in that cubby depends on frame size, but there's at least enough room to stash a small tube.The tunnel that the shock passes through is large enough to fit a coil shock, or even an air shock with a larger air can, something like a Float X2. A small fender helps keep mud from getting thrown onto the shock’s stanchion and the bottom of the channel below the shock is angled to make it easy to spray away any accumulated mud.There’s a threaded bottom bracket and ISCG 05 tabs which are an absolute necessity in this case due to that high pivot design – the lower roller is required to ensure there's enough chain wrap around the chainring. The Druid was designed to be an all-round trail bike and its geometry numbers reflect that goal. The head angle sits at 65.6-degrees with a 150mm fork, or 66-degrees with a 140mm fork. The effective seat angle is 75.6 degrees and the actual angle increases depending on the frame size, which is good news for taller riders – the seat tube angle should remain reasonable even when the post is at full extension. 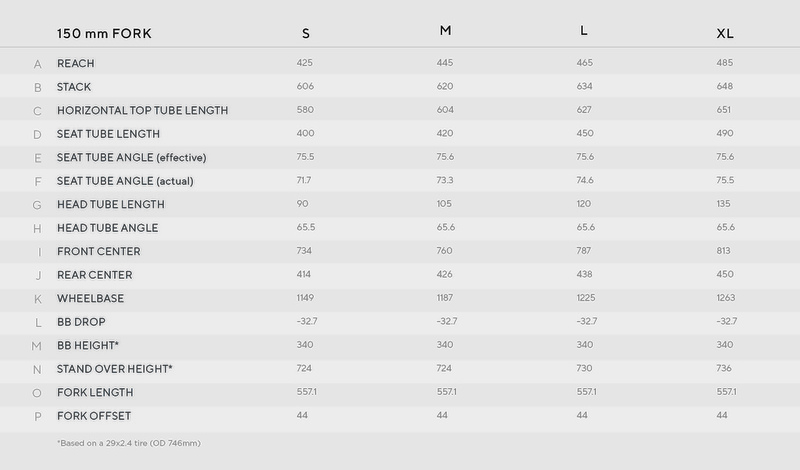 Bike reach numbers have been fluctuating all over the place over the last few years, but at the moment it seems that 460 – 480mm has become fairly typical for a size large and the Druid is right in there at 465mm. There's a different rear center length for each frame size, a feature that makes a lot of sense yet still isn't all that common. The size small has a rear center length of 414mm, and the number increases by 12mm for each size, all the way up to 450mm for the XL. The large tested here has a rear center measurement of 438mm. Suspension Design The Druid's high single pivot suspension design gives it a rearward axle path and at full compression, the rear center increases by 26mm. That axle path is one of the main reasons this suspension design is so appealing – in theory, it should allow the rear wheel to easily move over obstacles without getting hung up and provide extra stability during large compressions. Of course, a high pivot also creates a large amount of chain growth, which is why an idler pulley is necessary. That idler prevents the chain from tugging on the chainring and minimizes pedal feedback.The size and position of that idler can be used to adjust the amount of anti-squat, which affects how the bike feels while pedaling. In the case of the Druid, the amount of anti-squat is around 120% at 30% sag, dropping down to 108% by the end of the travel. According to Owen Pemberton, “The beauty of the high pivot, idler equipped design is that we can tune the pedaling efficiency while still keeping a fully active suspension system. This is highlighted by the low amount of pedal feedback in the system.” The Druid has a progressive suspension design, with a leverage ratio that's designed to provide small bump sensitivity at the beginning of the stroke, and then enough ramp up later in the travel to keep it from going through its travel too quickly. Both myself and Ali had a desire to start a small company/brand that would allow us to develop the products that we wanted to create without having to keep one eye on pleasing the mass market. We often spoke about the craft beer industry and how you can relate what the bigger bike brands produce to brands like Budweiser, Kokanee, Carling, etc...It’s not a bad product, it does what it’s supposed to, but in a way that will appeal to as many people as possible. And then you have these small upstart brands, much like the craft breweries, popping up and making the product that they want to make, purely because it’s what they want to make. Some are a bit more experimental than others, some are better quality than others, but they all have a real-ness that a growing number of customers seem to associate with. We felt like there was enough room for another small, boutique, brand to offer a somewhat unique product, and here we are with Forbidden and the Druid. Climbing The Druid may look more like a freeride bike than a singletrack slayer, but it holds its own when it comes time to climb. There's plenty of anti-squat to keep it from diving too deeply into its travel, and I never felt the need to reach down for that blue compression lever. We're seeing head angles get slacker and slacker across the board every season, but there's something to be said about not going too slack, especially on bikes that will be doing more than just plummeting down the fall line. The Druid's 65.6-degree head angle gives it a very neutral steering feel – it isn't overly sluggish and navigating through tighter, more technical climbs wasn't any trouble. In fact, it's close to a Goldilocks bike, at least for me - all the dimensions worked extremely well for my 5'11” height. The seat angle wasn't too slack or too steep, and the same goes for the chainstay length – everything felt just right. Granted, it doesn't have have the same level of liveliness as, say, the Ibis Ripmo, but it's still a very competent climber.The one slight downside of the high pivot suspension design is that the idler pulley was a little noisier than a 'traditional' setup at times, especially in muddier conditions, or if the chain needed some lube. That extra bit of noise will be familiar to anyone that used to run a chain guide with an upper and lower pulley wheel. There's also probably a little extra friction in the drivetrain as a whole, and I did notice that pedaling felt smoother when I switched back to a bike without an idler. On smoother, flowier descents the Druid behaves like a well-mannered trail bike should. It's calm, stable, and easy to whip through tight turns, although it does take a tiny bit more effort to bunnyhop and pop it up and over obstacles on flatter sections of trail - it has more of a ground-hugging nature rather than being ultra poppy and playful. But smooth and mellow trails aren't really what the Druid was designed for – it's on the rough, rock and root-filled sections where that high pivot design really begins to shine. There may only be 130mm of rear travel, but the Druid's ability to stay on track in chunky terrain is outstanding. The suspension has the firmer, more supportive feel you'd expect from a shorter travel bike on smaller bumps, but its ability to smooth out bigger hits is what separates it from other bikes in this travel bracket. It's a sensation that seems to dare you to go even faster into chopped up sections of trail, simply to see how the back end will respond. The way that the rear wheel gets out of the way, especially at higher speeds, goes a long way towards muting impacts. You can still feel the terrain underneath your tires, but it's as if someone smoothed out all the pointy bits, which makes it easier to remain on track. The Troy is a more active climber, which gave it good traction on techier climbs, but I made use of the compression lever much more often than I did on the Druid on smoother ascents. It also has a slacker seat tube angle, which, combined with the shorter chainstays, put me in a more rearward position than on the Druid, and I had to pay more attention to my weight distribution in order to maintain traction. Both bikes are testaments to just how capable mid-travel 29ers have become, and either one can handle a hearty serving of gnar. When it comes to small-bump sensitivity I'd give that point to the Troy – its suspension feels extra-supple on chattery sections of trail. The Druid has a little firmer suspension feel initially, but it opens up nicely when plowing through repeated impacts. It's almost too close to call, but I felt more comfortable on the Druid in rougher terrain, despite the fact that is has 10mm less travel - the longer chainstays and that high-pivot design make it possible keep charging forward without getting knocked off line. There's also the fact that the Devinci has SuperBoost spacing, while the Druid has 'regular' Boost, although that really only matters if you have a wheelset you're planning on transferring over to a new frame. Technical Report The Forbidden is only available as a frame only, but there were a few components on the test bike that are worth a mention.